Going for Bold: This month’s bold cover look by Robert Nguyen, with gold studs and spikes, is a traffic stopper with endless variations for clients’ holiday events. If there is one word to describe Robert Nguyen, this month’s cover tech, it’s exuberant. This multi-talented nail artist has contributed frequently to the magazine, yet waited patiently for several years before he got a chance to do a NAILS cover. Yet in true “Bert the Nail Guy” fashion, he didn’t waste a minute. Formerly an international guest artist for OPI, Nguyen recently became director of education for Color Club. His intricate stiletto nails in honor of the Year of the Dragon graced the cover of VietSALON magazine in 2012. While competing all over the world and appearing on the reality show “Nail’d It,” Nguyen began scouting locations for a salon of his own. Nguyen is friendly, gregarious, and generous with his time. Despite his hectic schedule, he has a dominating social media presence, and his humorous takes on life are about as mesmerizing as his talent for nail artistry. This month’s bold cover look, with gold studs and spikes on a white and negative-space background, is a traffic stopper with endless variations for clients’ holiday events. 1. Prep nails. Apply OPI Free Forms to the nails. Using OPI Absolute Crystal Clear powder and Absolute Monomer with a Royal Point brush, sculpt out the free edge of the nail to the desired length and create a coffin shape. 2. After applying acrylic over the whole nail, remove the forms and use an OPI Edge 180 to shape the sidewalls and lateral folds. After surface filing, use an OPI Flex 220-280 to smooth out the surface. Use OPI NAS-99 with an Expert Touch lint-free nail wipe to cleanse the nail and remove oils and dust. 3. Apply two coats of OPI GelColor Don’t Bossanova Me Around to all 10 nails. Cure for 30 seconds in the LED lamp after each coat. 4. Apply a layer of hard gel to the nail and set the charms and studs in your chosen pattern. Cure for 30 seconds in the LED lamp. 5. Using white acrylic paint, paint the color in for the positive portion of your negative space geometric design. 6. 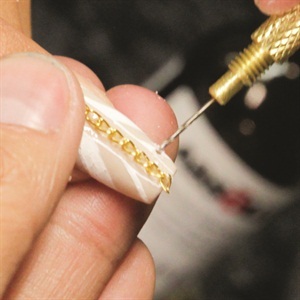 Drill a hole near the tip of the nail using a hand drill tool. 7. Insert a charm into the drilled hole. 8. The final nails exhibit a host of cohesive patterns and textures.